With the rise of technology and new media, a wave of trends has arrived that will reshape the retail landscape and consumers shopping behaviour. 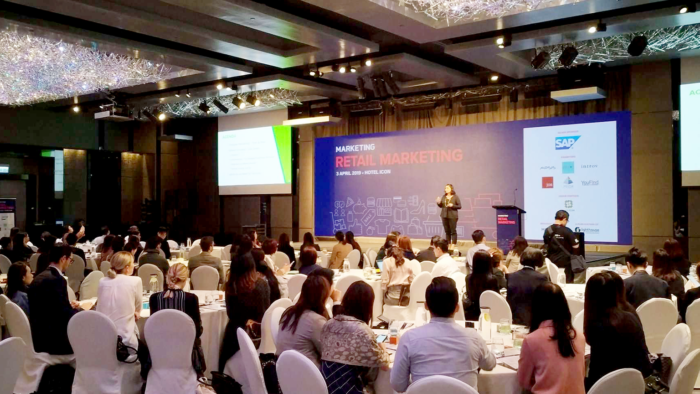 During the 2019 edition of Marketing Magazine’s Retail Marketing Conference held yesterday (3 April) Hong Kong’s top industry leaders observed the current array of retail marketing strategies, looked ahead to retail’s future, and questioned how best to transform challenges into new opportunities through innovation. Kicking off the one-day conference held at the Hotel Icon, Simois Ng, head of marketing and communications at Sony, highlighted that loyalty programmes help brands get closer to customers. In the face of difficulties reaching opt-out customers and potential millennials, Sony’s loyalty programme “Sonnion” had brought back more fans to Sony’s direct touchpoints, which allowed the brand to collect consumer data, study consumers’ behaviour, and create a better customer journey through omnichannel marketing. The highlight C-suite panel “Hong Kong – cross-channel strategies and how to hybridise a physical and online store experience”, tackled the emerging eCommerce trend’s place in a city where physical stores still remain the standard. G2000’s senior marketing manager Regine Tin, Lego’s head of marketing for Hong Kong, Taiwan, and Macau Kenny Sham, and president of Mars, Ian Burton talked about how brands can engage customers to a greater extent in physical stores, championing the brand’s unique experience with customers. Tin, in particular, mentioned that brick-and-mortar stores can communicate G2000’s brand identity with consumers. In terms of the customer journey, in-store staff can offer advice to customers in person – an experience that online strategies find hard to compete with. Sham agreed and said that in developed markets, a physical store is still crucial as it incorporates sales and new shopping experiences. “A branded store is an ideal place for us to engage customers. It helps build higher customer loyalty and integrate eCommerce strategies into offline marketing efforts, creating a win-win situation for both online and offline,” Sham explained. Speaking of building a world-class retail experience, Gary Lo, managing director and principal instructor at Glo Consulting, spoke on the subject at his on keynote. Lo said location, space, decoration, and setting of a retail shop play a strategic role in creating customer experiences. The Apple store and Starbucks are typical examples of utilising the space and vibe of a store to draw customers in. In the boom of the digital era, technological innovations are integrated into retail stores. Yvonne Leung, CMO of Alipay HK, gave an enlightening talk on her company’s experiences with the technology. Alipay HK had opened an unmanned store “Futureland” to demonstrate the future of retail. It showcased the self-checkout system, and featured the “Taobao AR Fashion Store” which employed AR technology to allow customers to transform their look with the “AR Try-on Magic Mirror”. However, in order to create a seamless experience for demanding customers and exceed their expectations, brands will merge physical retail spaces with online channels, and focus on the experience but not just the tangibles. Olivia Kosasih, former head of customer engagement at Bluebell, said at another of the day’s panel discussions that customers are demanding experiences during their consumer journeys, experiential marketing will continue to be the trend. Ian Milne, head of alternative channels APAC at lululemon, closed off the day with his talk. He gave lululemon as an example to showcase the symbiosis of experience and the tangibles. The company offers free yoga classes to guests in stores to encourage them to work out, which allows the brand to engage the local community. The Retail Marketing Conference shows that Hong Kong may be a shopper’s paradise but that it will take a lot of work to keep it as one. Fortunately, the even also showed that the industry is on the case. Low had been with the brand for over five years. .. While smartphones have become inseparable companions, a study found that 60% of marketers are attributing less than 10% of their b..